BACKGROUND: South Africa's (SAs) decline in labour productivity in the manufacturing sector is a cause for concern. The sector turns to employees for innovative productivity improvement initiatives. Employees need to know what activities they are currently performing that need to improve. This is where a 360-degree performance appraisal system plays a growing role. The 360-degree performance appraisal is a valuable tool that provides an opportunity for employees to work together to identify strengths and areas that need improvement. AIM: This study investigates the influence of a 360-degree performance appraisal system for the improvement of labour productivity in the automotive parts manufacturing sector in SA. SETTINGS: The study investigated the production and related experiences of an automotive parts manufacturing company that has adopted a 360-degree strategy. The company operates in the eThekwini district Municipality in KwaZulu-Natal. It assessed if 360-degree performance appraisal is responsible for the company's labour productivity improvements. METHODS: The investigation was achieved by collecting pre- and post-360-degree quarterly data for spoilage, absenteeism, capital investment and labour productivity. RESULTS: The 360-degree performance appraisal has no influence on labour productivity improvement. However, past capital investment plays a significant role in labour productivity increase. Results also showed a relationship between spoilage rate and labour productivity improvement. CONCLUSION: In order to maximise performance, a comprehensive performance policy must be developed, which aligns employee appraisal to performance. The study uncovered the strengths and weaknesses of a 360-degree performance appraisal system for labour productivity improvement in SA. Organisations are faced with the challenge of promoting innovative productivity improvement among employees. Hence, productivity plays a crucial role in the organisation's competitiveness. Thus, innovation supports productivity through the new uses of technology in the business, improved industry methods, meeting changing customer demands and better systems and processes (Business Victoria 2016). For an organisation to evolve, people working within it have to be involved in processes that improve the organisation's productivity. Fourie (2008) is of the view that organisational effectiveness depends on an appropriate recognition and reward system. The recognition and rewards can be used to increase performance in organisations that have adopted the 360-degree performance appraisal. Therefore, a comprehensive performance policy must be developed that aligns pay (or other incentives) to performance. The alignment of a 360-degree performance appraisal indicates that the process for achieving an effective performance management for productivity improvement should encompass a number of activities (Parry & Lacey 2000). This includes joint goal-setting, continuous progress review and frequent communication, feedback and coaching for improved performance, implementation of employee development programmes as well as the rewarding achievements. The 360-degree performance appraisal alignment is regarded as a systematic process by which the overall performance of an organisation can be improved. This can be achieved by developing the performance of individuals within a team framework, which ultimately increases productivity (Kaur 2013). The performance appraisal process is a means of promoting a superior-performing workforce by emphasising job descriptions, identifying a performance-improvement plan and establishing a 360-degree feedback mechanism within a competence framework (Fourie 2008). The 360-degree performance appraisal is the systematic collection and feedback of performance data on an individual or group, derived from a number of stakeholders on their performance, which in turn helps the organisation to identify performance gaps in order to build the required competencies among individuals and groups (Mukhopadhyay 2016). A well-managed and integrated 360-degree feedback process provides good quality feedback from colleagues and supervisors, which can be a definite improvement over feedback from a single individual (Fourie 2008). Consequently, this study examines the suitability of a 360-degree performance appraisal system as an appropriate tool to increase labour productivity. Oshodi (2011) emphasises that the systems of the 360-degree feedback provide one of the best methods for understanding personal and organisational developmental needs. Many employees feel that 360-degree feedback is more accurate, more reflective of their performance and more validating than feedback from the supervisor alone (Drakes 2008). When feedback comes from a number of individuals in various jobs, discrimination based on race, age, gender and other factors can be reduced (Drew 2009). This multi-source feedback and its role in wider performance management practice has been the subject of considerable study, theoretical debate and divergent opinions. Typically, a 360-degree feedback system is where an individual leader's staff, peers, and supervisor are invited to provide scores on a range of questions relevant to their leadership role. The leader (who plays a role of a ratee) provides 'self' scores against which the perceptions of others are compared. Peiperl (2001) defines this process as 'peer appraisal' which 'begins with a simple premise that the people best suited to judge the performance of others are those who work most closely with them'. Organisations in SA should revise their performance management philosophies and develop recognition strategies, policies and practices that help to achieve new business goals and support organisational and culture change (Smith 2007). Such revisions should enhance teamwork, employee development and customer service. Hence, the performance management philosophies should provide a more objective measure of a person's performance. It is against this background that the study focuses on a 360-degree performance appraisal system, given the low labour productivity levels in the South African manufacturing industries (UNIDO 2013). SA lacks both short-term and long-term growth in productivity (UNIDO 2013). The Conference Board (2015) indicates that SA showed a weakening of productivity growth to -0.4% in 2014, while total factor productivity growth declined at an even higher rate of -3.3%. Its labour productivity, in the manufacturing sector, is low when compared to Korea, the United States of America (USA), Taiwan, Japan, France and the United Kingdom (UK) (Klein 2012). The South African manufacturing industry only achieved 36% of the USA productivity level in 2014 (The Conference Board 2015). Hence, this study investigates whether a 360-degree performance appraisal system has the ability to improve labour productivity in the selected automotive parts manufacturing company. This section discusses an overview of the 360-degree performance appraisal system. The appropriateness of the system as a performance-improvement tool as well as its process for superior performance concludes the section. The 360-degree feedback evaluation is a popular performance appraisal method that involves the evaluation of inputs from multiple levels within the firm and from external sources (Mukhopadhyay 2016). The method is different from the traditional performance reviews, which provide employees with feedback only from supervisors (Gallagher 2008). In this method, employees in the company provide ratings. This includes senior managers, the employees, supervisors, subordinates, peers, team members, and internal or external customers (Drakes 2008). As many as 90% of Fortune 500 companies use some form of 360-degree feedback for either employee evaluation or development (Riboldi & Maylette 2007). Most companies use results from 360-degree performance appraisals not only for conventional applications but also for succession planning, training, and professional development. Unlike traditional approaches, 360-degree feedback focuses on skills needed across organisational boundaries. By shifting the responsibility for evaluation to more than one person, many of the common appraisal errors can be reduced or eliminated (Drakes 2008). The method may provide a more objective measure of a person's performance. Riboldi and Maylette (2007) add that multiple sources of evaluation result in a broader view of the employee's performance and may minimise biases that result from limited views of behaviour. Having multiple raters also makes the practice procedurally and substantively fair. As a result, it is important for all parties to know the evaluation criteria, the methods for gathering and summarising the feedback and the use to which the feedback will be put (Roman 2009). However, an appraisal system involving numerous evaluators will naturally take more time and, therefore, be more costly. Nevertheless, the way companies are being organised and managed may require innovative alternatives to traditional top-down appraisals. On the other hand, some managers indicate that the 360-degree feedback method has problems (Wright 2008). Ilene Gochman, the director of Watson Wyatt, indicated that the 360-degree performance appraisal negatively correlated with financial results (Wright 2008). In addition, General Electric's (GEs) former CEO, Jack Welch, maintains that the 360-degree system in his firm has been 'gamed' and that people were saying nice things about one another, resulting in all good ratings (Kiger 2006). Another critical view with an opposite twist is that input from peers, who may be competitors for pay raises and promotions, might intentionally distort the data and sabotage the colleague. Yet, since so many companies use 360-degree feedback evaluation, it seems that they have found ways to avoid the pitfalls. Google has a different approach to 360-degree feedback as it requires managers and employees to nominate 'peer reviewers' from anywhere across the organisation (Drew 2009). However, the biggest risk with 360-degree feedback is confidentiality (Wright 2008). Consequently, many companies outsource the process to make participants feel comfortable that the information they share and receive is completely anonymous. Organisations are continually looking for ways to improve performance and satisfy the demands of all stakeholders (Peacock 2007). This involves change, which then becomes the pivotal dynamic for success. Thus, 360-degree feedback plays a growing role in organisations through its ability to provide structured, in-depth information about current and future performance (Kiger 2006). Warr and Bourne (2000) indicate that, when professionally managed, the 360-degree feedback increases individual self-awareness and, as part of a strategic organisational process, it can promote an increased understanding of the behaviours required to improve both individual and organisational effectiveness and contribute to more focused development activities built around the skills and competencies required for successful organisational performance. In addition, the 360-degree performance appraisal increases involvement of people at all levels of the organisation, increases individual ownership for self-development and learning, as well as providing the increased familiarity with the implications of cultural or strategic change (Peacock 2007). It involves the evaluation of inputs from multiple levels within the organisation and from external sources (Suri 2016). Typically, performance appraisal has been limited to a feedback process between employees and supervisors (Mukhopadhyay 2016). However, with the increased focus on teamwork, employee development and customer service, the emphasis has shifted to employee feedback. Hence, the questionnaire is the main approach used in the 360-degree performance appraisal (Kiger 2006). The 360-degree performance appraisal committee validates the questionnaire by ensuring that the assessment instrument and procedures are effective in terms of its stated aim. It gathers structured feedback from a number of sources about the behaviour and style of an individual or team at work. For each individual, questionnaires on observable behaviours are completed by the individuals themselves, staff they manage, their peers, their customers and their managers. The results are compiled into a feedback report in which data from each source is presented separately. Consequently, the report is provided to the individual who then plans how to build on competencies and improve personal performance. The reliability, fairness and acceptability of the feedback process are increased when the input is drawn from multiple sources. Wright (2008) indicates that the competencies are requisite human capabilities for an organisation to maintain and develop competitive edge. These have a causal relationship with effective and superior performance in a job situation and therefore are predictive for an individual's behaviour and performance (Mukhopadhyay 2016). Employees perform well when they are productive (Fleenor & Prince 2016). Productivity implies concern for both effectiveness and efficiency. Consequently, the 360-degree performance appraisal approach is a formal, structured system of measuring and evaluating an employee's job, the related behaviour and outcomes to discover how and why the employee is presently performing on the job and how they can perform more effectively in the future (Mukhopadhyay 2016). This shows a significant link to 360-degree performance appraisal as an important tool for productivity improvement. As a result, this study investigates whether the 360-degree performance appraisal system has the ability to improve labour productivity in the automotive sector. It explores the suitability of 360-degree performance appraisal as an appropriate tool for productivity improvement. H1: The implementation of the 360-degree performance appraisal leads to labour productivity improvement in the automotive parts manufacturing company. H1o: The implementation of a gainsharing programme does not lead to labour productivity improvement in the automotive parts manufacturing companies. H2: An increase in the spoilage rate increases labour productivity in the automotive parts manufacturing companies. H2o: An increase in the spoilage rate decreases labour productivity in the automotive parts manufacturing companies. H3: An increase in the absenteeism rate increases labour productivity in the automotive parts manufacturing companies. H3o: An increase in the absenteeism rate decreases labour productivity in the automotive parts manufacturing companies. H4: An increase in the allocation of workers in production increases labour productivity in the automotive parts manufacturing companies. H4o: An increase in the allocation of workers in production decreases labour productivity in the automotive parts manufacturing companies. H5: The accumulation of past capital investments increases labour productivity in the automotive parts manufacturing companies. H5o: The accumulation of past capital investment decreases labour productivity in the automotive parts manufacturing companies. The method for this research will be discussed under the following headings: research design and approach, company that participated in the study, data collection, as well as the time series data and analysis. This study was quantitative in nature. It examines the relationship of labour productivity as a dependent variable to absenteeism and spoilage rates, the number of workers involved in production, as well as post 360-degree performance appraisal dummy. Bryman and Bell (2007) explain that the quantitative approach involves the use of statistical procedures to analyse the data collected. Consequently, after the measurements of the relevant variables, the scores were transformed using statistical methods. The study was also conclusive in design. Conclusive studies are meant to provide information that is useful in decision-making (Yin 2008). A convenience sample from one large automotive parts manufacturing company situated in the outer western region within the eThekwini district Municipality in the province of KwaZulu-Natal in SA was used. This sampling technique relies on data collection from population members who are conveniently available to participate in the study (Yin 2008). The company had adopted the 360-degree performance appraisal strategy and agreed to participate in the study. The 360-degree performance appraisal system was their first round of structured approach for measuring and evaluating employees' jobs. This system was used on the company's blue-collar employees whose job requires manual labour. The company had 1403 employees. It operates a three-shift system. The collection of data from the company that participated in the study was carried out in two phases. This involved the collection of pre- and post-360-degree performance appraisal results from company records for spoilage, absenteeism, capital investment and labour productivity. The pre-360-degree performance appraisal results were quarterly data reflecting the company's performance over the three-year period prior to 360-degree performance appraisal implementation. This includes data from the first quarter of 2004 to the final quarter of 2006. The post-360-degree performance appraisal data reflect the company's performance for three years after 360-degree performance appraisal was implemented. This includes data from the first quarter of 2007 to the final quarter of 2009. In the period between 2010 and 2016, the company was involved in labour restructuring. This emanated from the strategic changes that took place in the motor assembly plant of the company it is supplying. Hence, the data from the restructuring period were excluded from the study. The company's quarterly time series data on absenteeism, labour productivity and spoilage rates were used. The measurements were based on a total of 24 observations. A dummy variable, which assumed the value of 0 and 1 to represent the pre- and post-360-degree performance appraisal periods, respectively, was introduced into the ordinary least squares (OLS) model. The aim was to isolate the pre- and post-productivity effects. Consequently, if the 360-degree performance appraisal proved to be a useful strategy in raising productivity levels, this would result in a statistically significant coefficient on the dummy variable. Hence, the favourable results regarding the co-integrating tests enabled the study to engage in quantitative analysis involving OLS in order to quantify the magnitude of the influence that the implementation of the 360-degree performance appraisal has had on labour productivity. Co-integration provides evidence of a long-run relationship between variables (Juselius 2006). The above model identifies labour productivity as a function of spoilage rate, absenteeism rate, the number of workers involved in production, investment and the 360-degree performance appraisal strategy. The investment variable is the labour productivity lagged by one period (that is, one quarter). This variable aims to capture previous machinery input and skills obtained by workers both through skills development programmes as well as learning through work experience. For the study to achieve its objective, the stationarity tests (as shown in Table 1) were conducted in order to determine the status of the variables. The results show that the variables exhibit mixed orders of integration. This suggests that the data have no long-run relationships. In principle, they can wander arbitrarily far away from each other (Juselius 2006). However, this section presents the results on the influence of labour productivity on other production-related variables. Table 2 presents the results for labour productivity as a dependent variable to absenteeism and spoilage rates, the number of workers involved in production, as well as the post-360-degree performance appraisal dummy. The results show that spoilage rate has a relationship and is statistically significant to labour productivity as shown by its t-value of 3.61, which is above the critical t-value of 2.06 at the 5% level of significance (Curwin & Slater 2002). However, the results must be viewed with caution. The co-integration results suggest that there is no long-run co-integrating relationship between the variables. Results as illustrated in Table 2 show that absenteeism rate has no relationship to labour productivity. This is determined by its t-value of 1.25. The value is below the critical t-value of 2.06 at the 5% level of significance, thus accepting the null hypothesis of no relationships between these two variables. The results show that the number of workers involved in production has no relationship to labour productivity. This is determined by its t-value of 1.73 which is below the critical t-value of 2.06 at the 5% level of significance. This result is confirmed by the co-integration test that shows the non-existence of long-run relationships. Results show that a 360-degree performance appraisal system has no relationship to labour productivity. This is determined by its t-value of −0.03, which is below the critical t-value of 2.06 at the 5% level of significance, thus accepting the null hypothesis of a relationship between these two variables. It has an adjusted R2 of 0.3. Furthermore, the serial correlation is also low at 1.32 when compared to the standard value of 1.89 at the 5% level of significance (Curwin & Slater 2002). The results are consistent with the co-integration tests carried out in Table 2, which asserts that the long-run relationships between the variables do not exist. 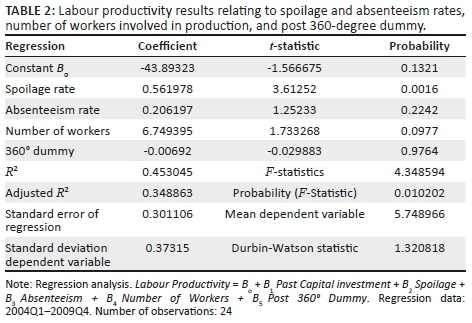 Table 3 illustrates labour productivity data as a dependent variable to past capital investment (lagged by one quarter), spoilage rate, absenteeism rate, number of workers involved in production and dummy variables. Results in Table 3 show that capital investment has a positive and statistically significant relationship with labour productivity. The accumulation of past capital investment (lagged by one quarter) plays a significant role in explaining current labour productivity increases. Results are determined by its t-value of 2.33. The results must be viewed with caution. The co-integration results suggest that there is no long-run co-integrating relationship between the variables. However, the results are above the critical t-values of 2.06 at the 5% level of significance, thus accepting the assumption of a relationship between the two variables. Positive relationship indicates that past capital investments increased labour productivity. The results show that spoilage rate (one quarter after the company has invested capital) has a relationship and is statistically significant to labour productivity. This is shown by its t-value of 3.81, which is above the critical t-value of 2.06 at the 5% level of significance. The results must be viewed with caution. The co-integration results suggest that there is no long-run co-integrating relationship between the variables. 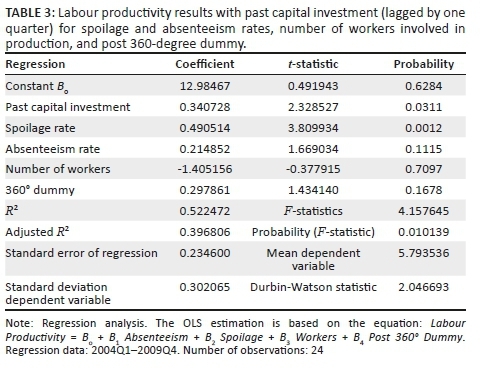 Results in Table 3 shows that absenteeism rate (one quarter after the company has invested capital) has no relationship to labour productivity. This is determined by its t-value of 1.67. The result is below its critical t-value of 2.06 at the 5% level of significance, thus accepting the null hypothesis of no relationship between these two variables. Results in Table 3 show that the number of workers involved in production variable (one quarter after the company has invested capital) has no relationship to labour productivity. This is determined by its t-value of -0.38. The result is below the critical t-value of 2.06 at the 5% level of significance, thus accepting the null hypothesis of no relationship between the two variables. Results show that the 360-degree performance appraisal system (one quarter after the company has invested capital) has no relationship to labour productivity. This is determined by its t-value of 1.43 which is below the critical t-value of 2.06 at the 5% level of significance, thus accepting the null hypothesis of no relationship between these two variables. This study investigates the influence of the 360-degree performance appraisal system for the improvement of labour productivity in the automotive parts manufacturing sector in SA. It examined the production and related experiences of an automotive parts manufacturing company that has adopted a 360-degree performance appraisal. Quarterly time series data on absenteeism, labour productivity, spoilage, number of workers involved in production and capital investment were used to analyse data. Results indicate that absenteeism at 1.25, the number of employees involved in production at 1.73 as well as 360-degree performance appraisal at −0.03 have no relation to labour productivity. Their t-values are below the critical t-value of 2.06 at 5% level of significance. However, it showed the relationship between the labour productivity variable and spoilage rate variable at 3.61. Its t-value is above the critical t-value of 2.06 at 5% level of significance. According to Suri (2016), an increase in labour productivity reduces direct material cost. The study also indicates that the implementation of 360-degree performance appraisal has an influence on spoilage rate. Hence, Kiger (2006) emphasised that the 360-degree feedback approach increases individual self-awareness and, as part of a strategic organisational process, reduces the rate of spoilage in production. These results are also supported by Fourie (2008), who adds that the organisational effectiveness depends on the appropriate appraisal systems. However, the results should be viewed with caution since the co-integration results suggest that there are no long-run co-integrating relationships between the variables. The researcher also measured the influence of the 360-degree performance appraisal to labour productivity (one quarter after the company has invested capital). It revealed that capital investment at 2.33 has a positive relationship with labour productivity. Its t-value is above the critical t-value of 2.06 at 5% level of significance. On the other hand, it shows that absenteeism at 1.67, the number of employees involved in production at -0.38 as well as 360-degree performance appraisal at 1.43 have no relation to labour productivity. Their t-values are below the critical t-value of 2.06 at 5% level of significance. Such results show that the companies use 360-degree performance appraisal for succession planning, training, and professional development (Riboldi & Maylette 2007). It is a desirable alternative as it has an influence on the spoilage rate. The system has an ability to influence labour productivity one quarter after the company has invested capital. In order to maximise performance, a comprehensive performance policy must be developed, which aligns employee appraisal to productivity (Smith 2007). The 360-degree performance appraisal creates a working environment that encourages worker participation. It is an appropriate system for succession planning, training and professional development (Riboldi & Maylette 2007). Hence, there was no relation between the 360-degree performance appraisal and labour productivity. The system is not a solution to inherent labour productivity problems. It is an approach that takes advantage of a focused organisational strategy to combine employee appraisal and participation. The system can be used for developing employee capital in the organisations. Thus, the employees will have the capabilities to solve organisational problems (Brewster et al. 2003). Consequently, the 360-degree approach was able to reduce the spoilage rate in the organisation. The study was limited to an automotive parts manufacturing company within the eThekwini district Municipality. It was conducted in a single company that has adopted the 360-degree performance appraisal. Hence, the results cannot be extrapolated to other companies within the sector. Secondly, it did not examine the process followed during the 360-degree implementation including (among others) the individuals that participated in the implementation process. It only used quarterly time series data to determine the pre- and post-labour productivity effects resulting from the use of the 360-degree performance appraisal. Lastly, the econometrics model (developed by the researcher) was of the OLS variety, solely due to data constraints. Future studies ought to use the more advanced Johansen VAR methodology or panel data analysis, both of which rely on large data sets. When to use and when not to use a 360-degree performance appraisal system. The applicability of a 360-degree performance appraisal approach to other industrial sectors. The process followed during the implementation of a 360-degree performance appraisal system. A more comprehensive investigation should be carried out using a randomised sample of the registered automotive component manufacturers that use the 360-degree performance appraisal to see if the results can be generalised.